If you rely on your calendar a lot then anything that speeds up adding or checking events is a boon. Anything that makes sure you enter every appointment correctly and that you never miss them can be more than a boon, it can be essential. The new Fantastical 2.5 for macOS adds a slew of features meant to help with all of this. Fantastical's strength has always been in speed and clarity, but it's one of those apps that works hard to minimise how much you use it. This new release is about saving you time with regular appointments, it's about trying to cut down the hours spent trying to arrange meetings with lots of people. It's also about giving you a new way to swiftly consult your calendar. 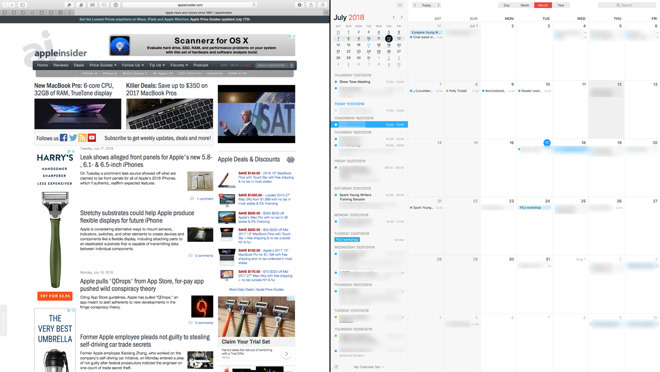 Possibly the smallest addition to version 2.5 is that you can now have what's called the mini-calendar in Split View with any other app on your Mac. Typically your calendar is an adjunct to what you're doing: you're finding out dates from somewhere and the putting them into Fantastical. 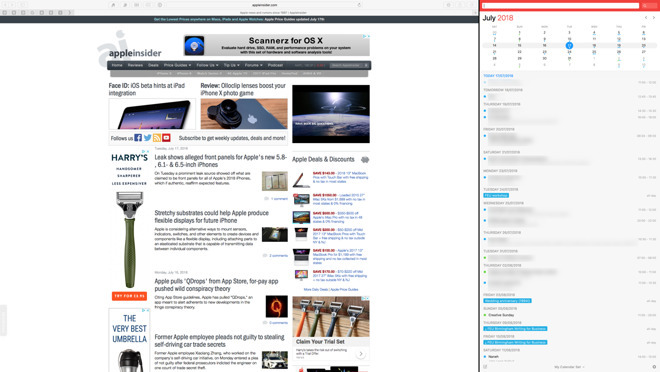 By default, this Split View with the main Fantastical window gives it and your other app half the screen each. You can click and drag so that Fantastical is reduced to a quarter of the screen instead but that squeezes down the view and makes it less usable. Fantastical has always had a mini-calendar that sits in your menubar, though, and in fact it originally began as solely that. 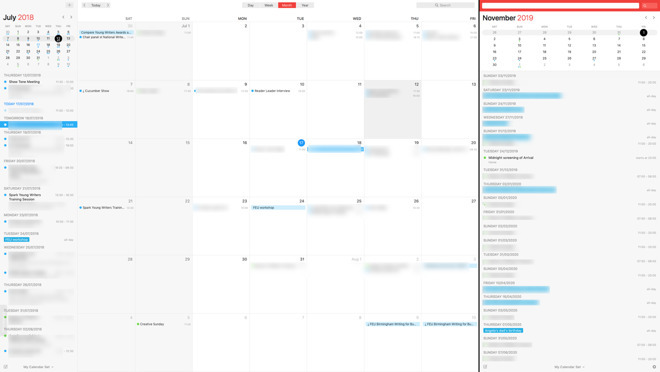 Now with version 2.5, you can choose to Split View with that mini-calendar and the difference is significant. There's no loss of clarity on your appointments, it's just better presented for the smaller space. It also means that you can have the regular Fantastical and its mini-calendar version in Split View together. So now you can much more easily look at the current and any other month you want. This is particularly useful when you're looking for a date when you and several other people can meet. Fantastical 2.5 adds another small but potentially key feature for helping with this. Whenever you create an event in Fantastical you can choose to invite other people. You enter their names into the event and Fantastical emails them an invitation. If they accept then they're shown as confirmed in the event and you don't even see their reply. Now, though, your invited people have an extra option where they can say no but also propose an alternative time. It doesn't matter whether they use Fantastical or not. In the invitation they get via email, they can click on Propose New Time. They then enter a time and date that's better for them and that gets sent back to you. It is undoubtedly a smart addition but in saving you the trouble of writing and reading emails to everyone about the time, it also opens the door to prolonging discussions. Previously if you proposed a date and time to one person then the odds of them just saying yes because it's easier are remarkably high. With Fantastical 2.5 making it so easy for them to propose an alternative, your invited person is going to propose an alternative. Then if you're inviting many people, it could be cacophony. It's this hard slog of arranging things with lots of people that probably led to the formation of Meetup, an online service for scheduling events like pub quizzes, clubs and sports. Fantastical 2.5 adds support for Meetup meaning that you can have your calendar show these meetings and also have them automatically update if anything changes. By default each one is switched off but you tick them on and then forever afterwards all events from those groups are shown on your calendar. If you didn't want to go to any then you'd just go to Meetup and leave the group but when it's simply one or two events you need to miss, you can do it in Fantastical. Click on any event and get the full detail pane. At the bottom there are controls for replying to say whether you're going or not. So the new Fantastical 2.5 aims to make adding and updating Meetup events automatic. It aims to make it easy for your invited people to propose changes and save you having to schlep through altering times and re-sending invitations. Ultimately, though, the odds are that the majority of times you use Fantastical, it is for yourself and yourself alone. Fantastical is already fast when you're adding a new event or looking to see if you're free next Wednesday. 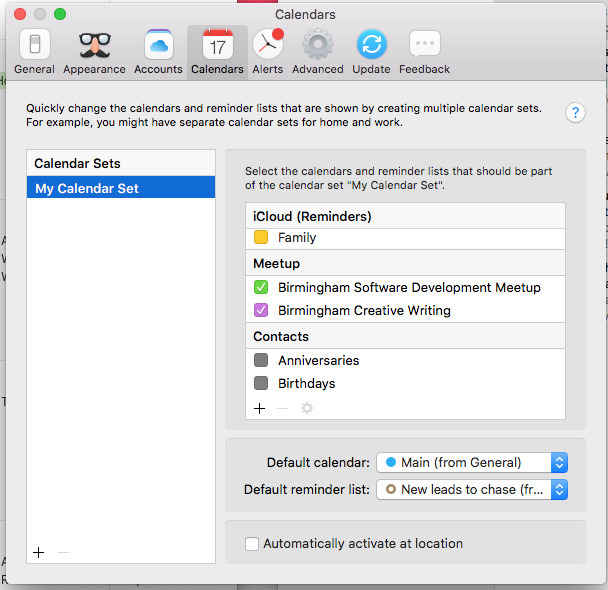 If you use the app and haven't already done so, check out the Preferences to set a keystroke for the menubar mini-calendar. The ability to tap a couple of keys and immediately see your next few weeks, to search for any event or to rapidly enter a new one is what makes Fantastical so good. That mini-calendar is so handy that you can go days without thinking to look at the main Fantastical window but now when you do, the new 2.5 release has added some subtle and smart improvements. In the Month view, you can click on an event and then move it forwards or backwards a day or a week with just a keystroke. When the event is highlighted, hold down Control and Option, then tap an arrow key and the event moves. It goes to the day you want but keeps the same times. The same keystrokes do slightly different things in the Week or Day view. In the week one, you can use Control/Option and the left or right arrow keys to move an event to the previous or next days. If you use the up or down arrows, though, you don't move the event to another day, you alter the start time and the duration of it. Hold down Shift and Control, then tap the up or down arrow keys and you change the end time of the event. It would be good to be able to move an event a whole day or week without having to switch to a different view first. It would also be great if you could add a third key, like Shift or Command and copy an event to its new spot. Yet this ability to nudge events around is deeply handy and far faster than going into the details and typing the new times. That said, one of the most common issues with changing an event's details has definitely been improved in Fantastical 2.5. Previously if you had an hour-long meeting then when you changed its start time, Fantastical automatically set its end time to be one hour later. So when actually you've learned you need longer for the meeting, you used to have to change the start time and then remember to correct the end time. Now when you type in the new start time, you can hold the option key and Fantastical will keep the end time where it was. None of these 2.5 improvements is gigantic and none of them are reason to switch to Fantastical all by themselves. 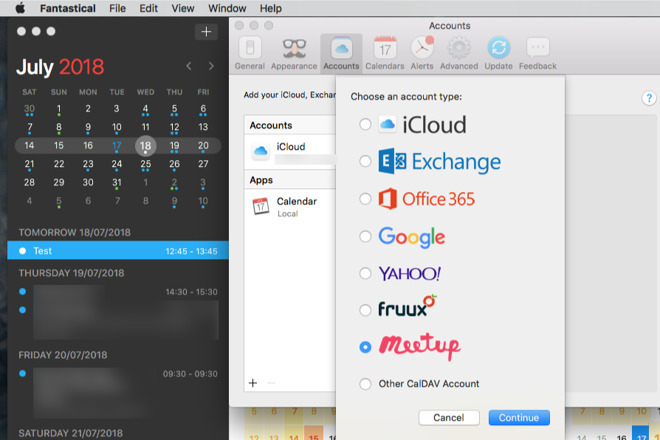 The real reason to switch is everything else Fantastical already did to make using your calendar as fast as possible. Yet when you have switched, these additions are a treat. Fantastical one of those apps that works to make you spend less time in it but does so well enough that you enjoy using the app and come back to it more often. The newly updated Fantastical 2.5 is free for existing users. If you're not an existing user then the macOS app costs $49.99 and is available either directly from the makers Flexibits or via the Mac App Store. There's also an iPhone edition, sold separately and currently at version 2.9.9, which which costs $4.99 from the App Store and an iPad edition which is $9.99.